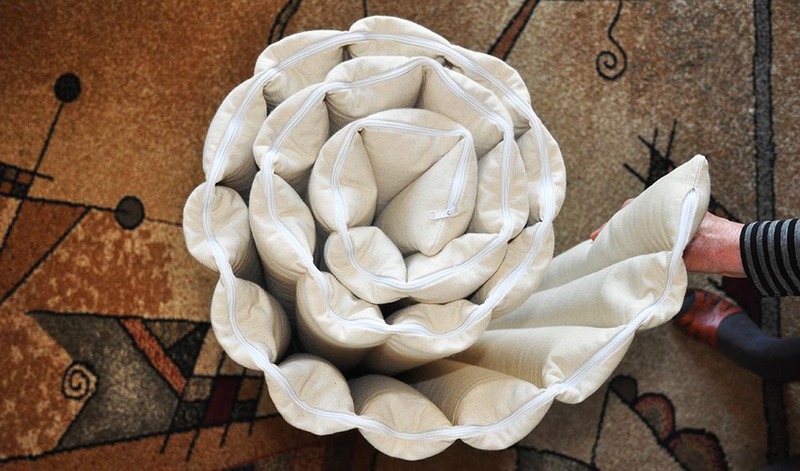 Eco-friendly healthy 100% organic buckwheat husk (otherwise known as buckwheat hull) mattress. Handmade in Poland with certified organic, grown for consumption buckwheat. Sleeping on a mattress with buckwheat husk is beneficial in many ways. Your mood will most likely improve, and pain or tension will reduce or be eliminated completely. The buckwheat husk adjusts to the shape of your body with ease. Your head and neck will be properly supported while sleeping. Our 100% organic mattress buckwheat hulls mustard seeds is loved by our customers. They’re appreciated for their firmness, ecological materials and longevity. But what is even healthier, is a mattress filled with a mixture of buckwheat hulls with mustard seeds. Health Benefits of Buckwheat Husk and Mustard Seeds Mattresses. It is made of 100% organic GOTS certfied cotton, of probably the highest quality available, beautiful and of tight weave. The cover is filled with a mixture of organic buckwheat hulls and mustard seeds. 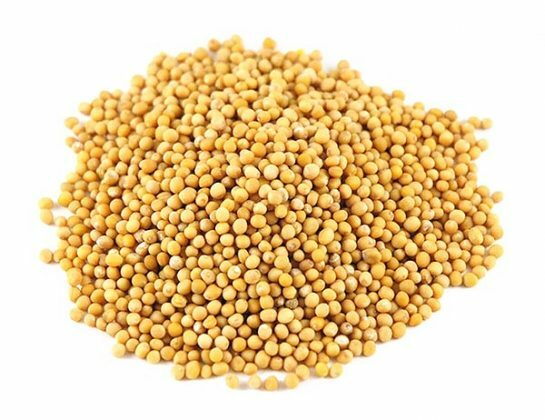 We add, depending on the size of the mattress, at least 3 kilograms of mustard seeds. In folk medicine charlock is used externally to heal rheumatic pain via pillows and mattresses filled with the seeds. 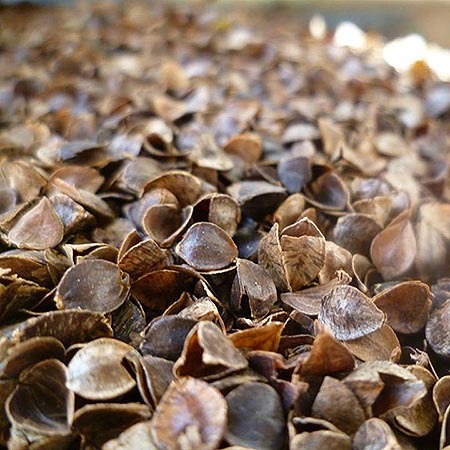 Charlock seeds generate a biological field, similar to a human biofield, which can have a positive effect on metabolism and boost the production of healthy cells to strengthen the immune system. Sleeping on a mattress with buckwheat husk can benefit you quickly. Your mood will most likely improve, and pain or tension will reduce or be eliminated completely. The buckwheat husk adjusts to the shape of your body with ease. Your head and neck will be properly supported while sleeping, which is important in part because spinal misalignment can affect how your internal organs work. Contact with buckwheat husk can release tension in the spine and improve the flow of spinal fluids. 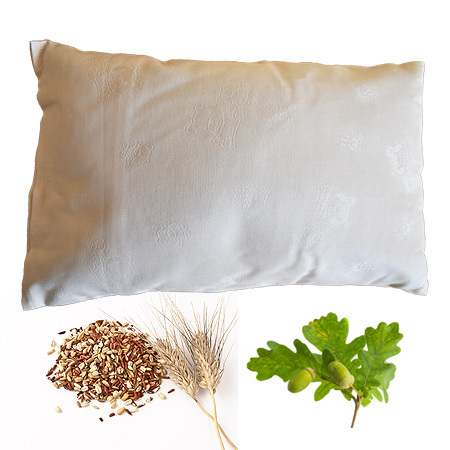 Organic buckwheat hulls mustard seeds mattresses made by EcoHealthLab are filled with 100% organic buckwheat hulls, grown and produced in Poland, covered in 100% organic cotton. 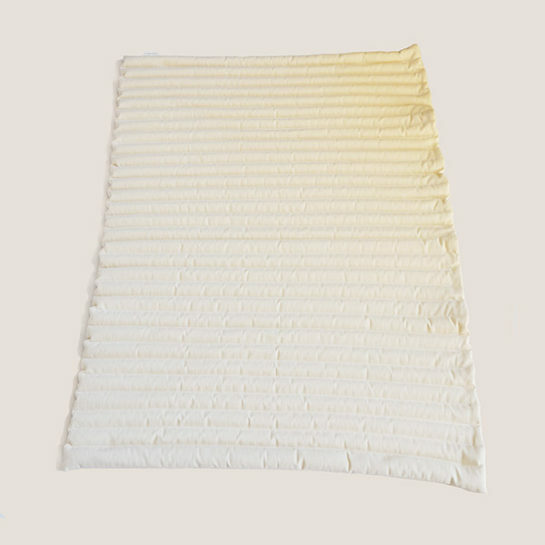 We offer white organic cotton or natural, undyed, unbleached organic cotton. Both are 100% GOTS certified. 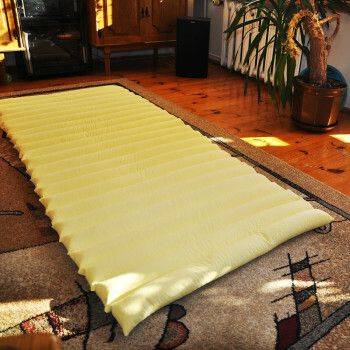 The mattresses are beautiful, extremly beneficial for human body and mind. After sleeping on a buckwheat / mustard seeds mattress you’ll wake up feeling refreshed and relaxed. It’s also suitable for meditation therapy. Moving freely, buckwheat husk will gently massage the whole body, improving blood circulation. 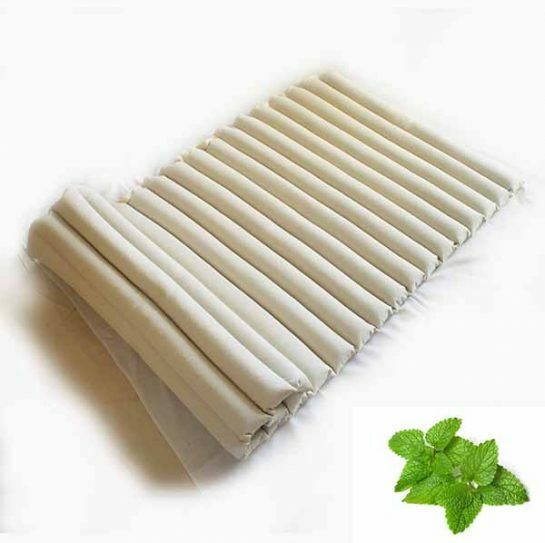 This mattress is also a great solution for people with fever, night sweats and hyperactivity – it maintains a constant temperature and doesn’t heat up excessively. 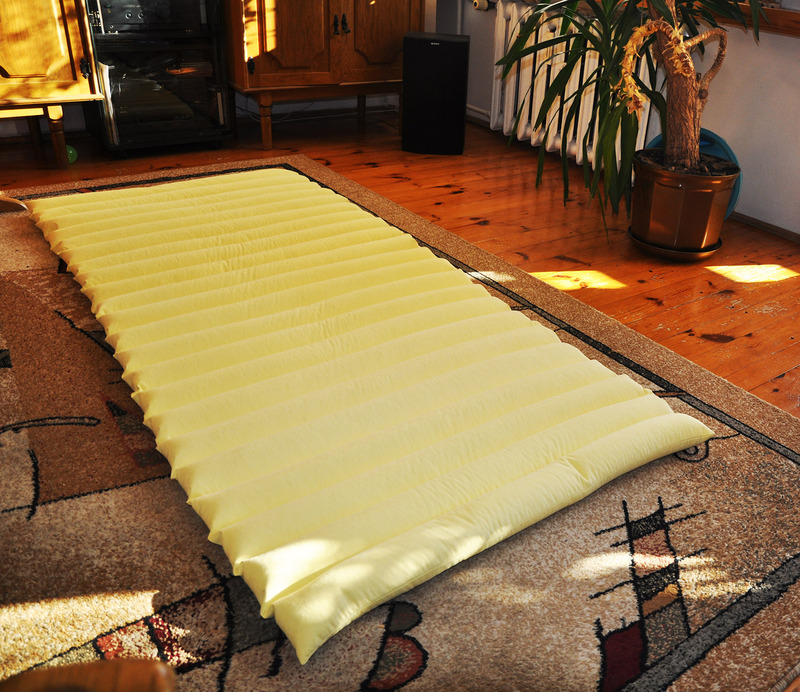 It’s ideal for sleeping at night, and relaxation during the day (for example while watching your favorite program on TV). 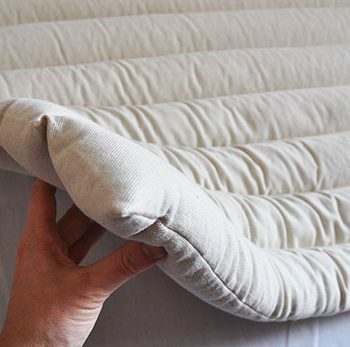 Handmade in Poland of buckwheat husks (a hypoallergenic byproduct of buckwheat used for food consumption), mustrd seeds, and cotton, our roll-able mattress is as firmly stuffed with buckwheat and mustard seeds as possible. High quality zippers allow you to remove or add buckwheat husk to fit your personal level of comfort and smooth out irregularities. The filling can’t move from one chamber to the other. There is absolutely no chemical odor, or any other smell. Every component has been carefully inspected. 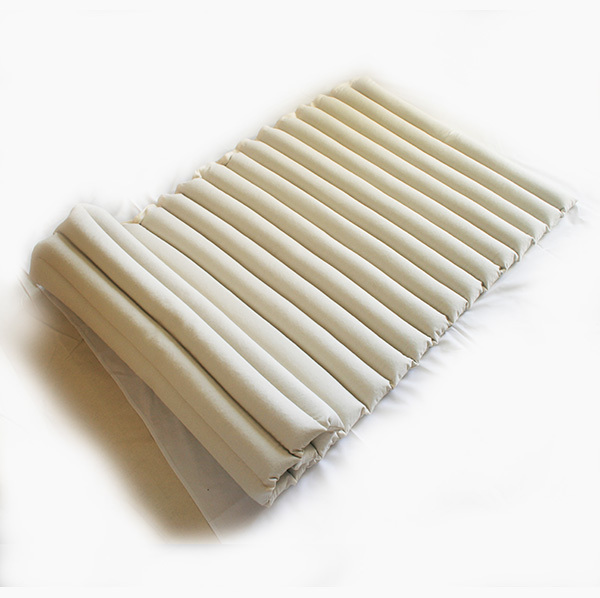 The high quality of the buckwheat hulls and cover ensure that this mattress will last for many years to come. Please choose one of the above mattress sizes, or let us know if you would like a custom size mattress. 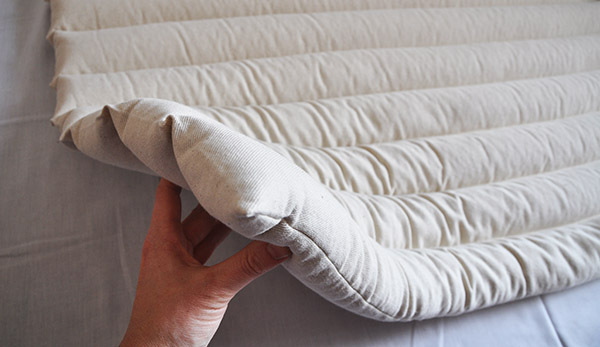 Our buckwheat hulls/ mustard seeds mattresses is made of certified, 100% organic cotton! 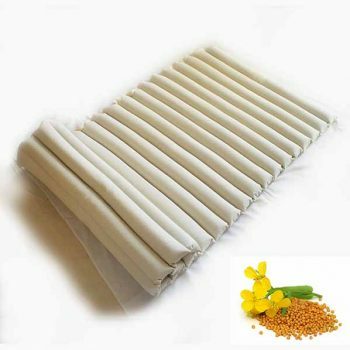 We can make a buckwheat husk / mustard seeds mattress which has different dimensions. 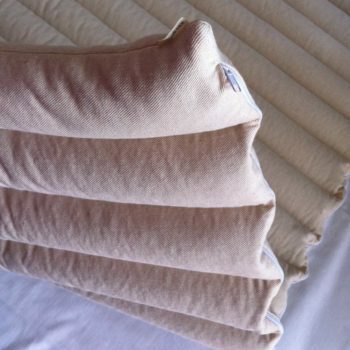 Contact us if you are interested in having a custom made mattress. I am so happy with my mattress and pillows ! Thank you ECOHEALTHLAB (Martyna), Your customer service is excellent, amazing. I am so grateful that you communicated so quickly with us and helped us understand our options so articulately. 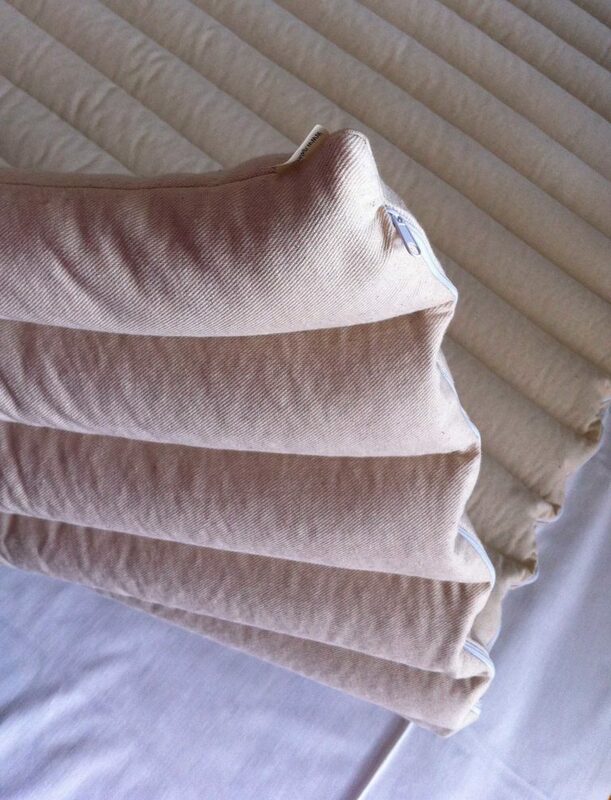 All of the fabrics you use, the linen, the organic cotton are beautiful. Such high quality. The mattress immediately made my back feel better. Especially my lower back. My body is completely supported. It’s comfortable on so many levels that it’s challenging to describe. 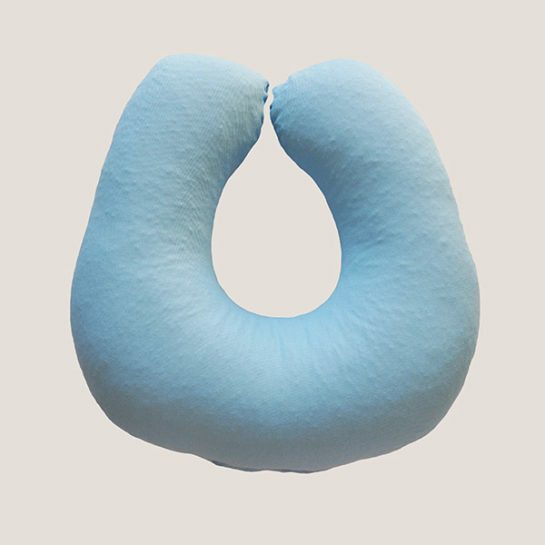 The buckwheat pillow supports my head and neck. It feels like there is air under my head. 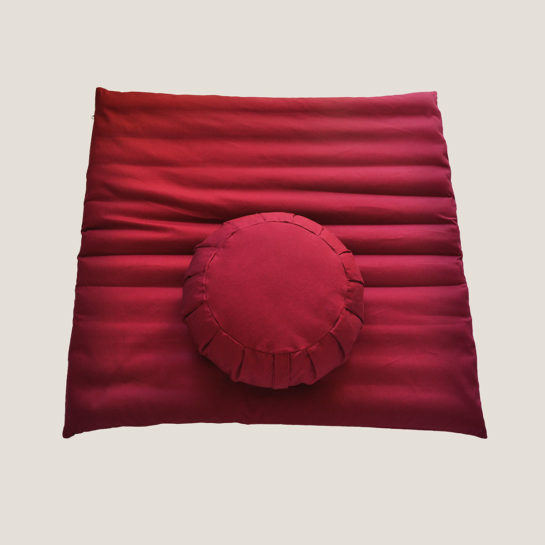 (other buckwheat pillows have felt kind of like a brick – but yours does not) I also love that it does not trap the heat from my head. UPS shipping made the shipment of the products a breeze. Just like ordering from somewhere in the States. I’m thankful beyond words for a chemical FREE, Organic, incredibly comfortable mattress. 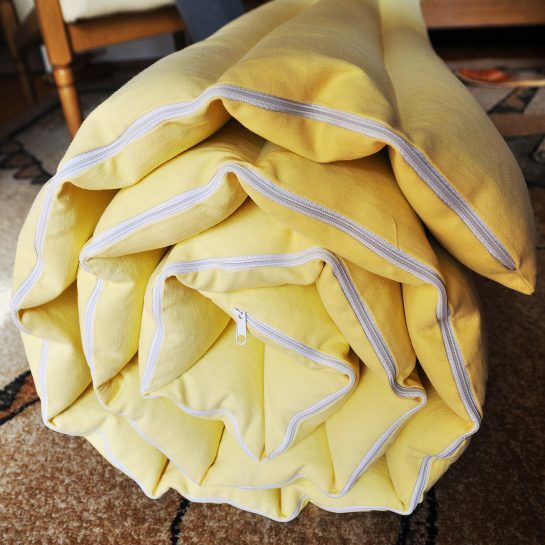 Charlock mattress, made of 100% cotton and filled with charlock/mustard seeds. The seeds come from a cultivation in Poland, and have the purity of a product prepared for consumption. Charlock, known in folk medicine, is used primarily to heal rheumatic pain, migraine, menstrual pains, to strengthen immune system. 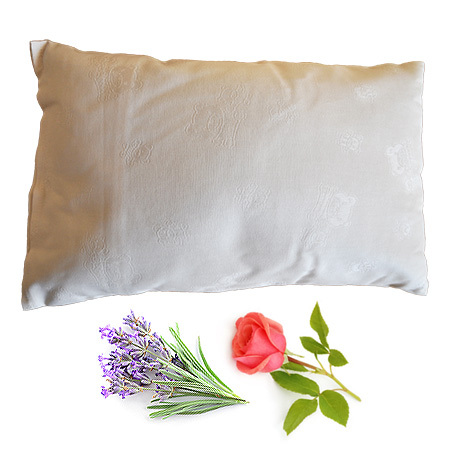 Aromatic eco-friendly pillow filled with spelt husks. Made with spelt that is organically grown in Poland. Spelt husks help with cystitis and rheumatic pains. Spelt has extraordinary rehabilitation properties. Placing it on selected parts of the body can alleviate joint, back and neck pains as well as headaches. 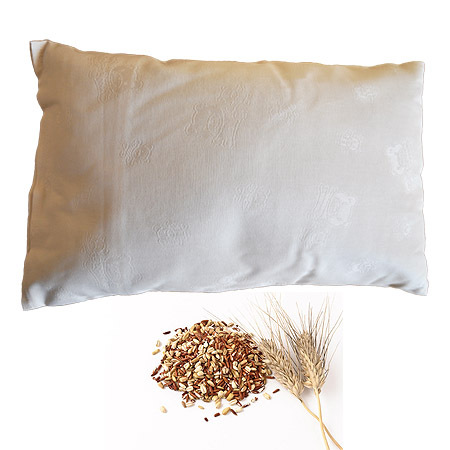 Sleeping on a pillow with spelt husk will make you feel good. Your mood will improve and any pain or tension will reduce or be eliminated completely.